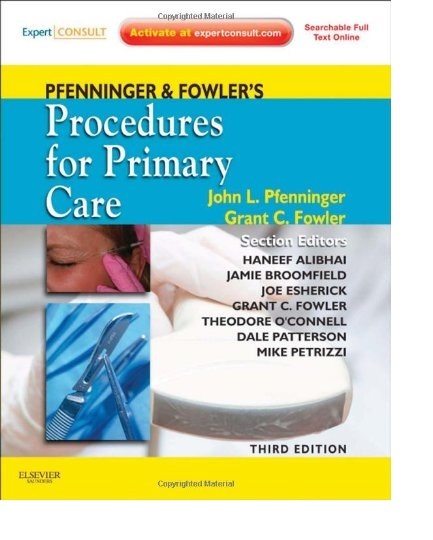 Pfenninger and Fowler's Procedures for Primary Care, 3rd Edition is a comprehensive, "how-to" resource offering step-by-step strategies for nearly every medical procedure that can be performed in an office, hospital, or emergency care facility by primary care clinicians. Designed for everyday practice, the outline format allows speedy reference while the detailed text and clear illustrations guide you through each procedure. The new edition of this best-selling book features full-color illustrations and easy access to the complete contents and illustrations, patient forms, and more online at www.expertconsult.com. Understand how to proceed, step by step, thanks to detailed text and illustrations. Locate critical information at a glance with numerous boxes and tables. Use the book for years with minimal wear and tear thanks to its sturdy cover. Patient education handouts to educate, save time, and reduce liability Coding guidelines included This best selling text now includes full-color photos and new sections on Aesthetic and Hospitalist Procedures in addition to an update of all the previous procedures discussed in prior editions!Access the complete contents and illustrations online, download patient education handouts and consent forms, view lists of device manufacturers, and more at www.expertconsult.com.Offer your patients a variety of cosmetic procedures using lasers and pulsed-light devices (including individual chapters on procedures for hair removal, photorejuvenation, skin tightening and skin resurfacing, and tattoo removal), and botulinum toxin, as well as new coverage of cosmeceutical skin care, tissue fillers, and photodynamic therapy.Master new procedures such as maggot treatment for chronic ulcers, endovenous vein closure, stress echo, insertion of the contraceptive capsule (Implanon) and tubal implant (Essure), musculoskeletal ultrasound, no-needle/no-scalpel vasectomy, procedures to treat acute headaches, and more.Don't worry! All the more basic office procedures are still included...with improved and updated discussions!Pfenninger and Fowler provide the latest and most comprehensive information on medical procedures that allow primary care physicians to more effectively treat their patients.